This volume examines the dominant neoliberal agenda for agricultural development and hunger alleviation in Africa. 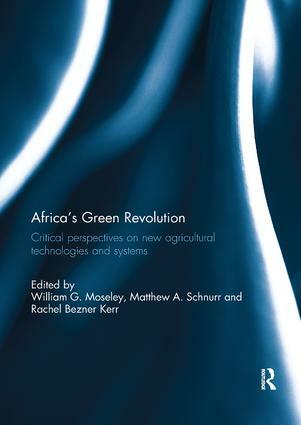 The text reviews the history of African agricultural and food security policy in the post-colonial period, across a range of geographical contexts, in order to contextualise the productionist approach embedded in the much heralded New Green Revolution for Africa. This strategy, supported by a range of international agencies, promotes the use of hybrid seeds, fertilisers, and pesticides to boost crop production. This approach is underpinned by a new and unprecedented level of public–private partnerships as donors actively work to promote the private sector and build links between African farmers, input suppliers, agro-dealers, agro-processors, and retailers. On the consumer end, increased supermarket penetration into poorer neighbourhoods is proffered as a solution to urban food insecurity. The chapters in this volume complicate understandings of this new approach and raise serious questions about its effectiveness as a strategy for increasing food production and alleviating poverty across the continent. This book is based on a special issue of African Geographical Review. William G. Moseley is a professor of geography and African studies at Macalester College in Saint Paul, MN USA. His research is focused on food security, agriculture, development and environment in the African context. Matthew A. Schnurr is an associate professor in the Department of International Development Studies at Dalhousie University in Nova Scotia, Canada. He is an environmental geographer with research and teaching interests in environment and development, political ecology, agricultural biotechnology, farmer decision-making, and environmental justice. Rachel Bezner Kerr is an associate professor in the Department of Development Sociology at Cornell Universit in Ithaca, NY USA. Her research interests focus on farmer-led agroecology, critical examinations of neoliberal approaches to agriculture, and the historical, political, economic, and gender dynamics that shape food security in sub-Saharan Africa.